See that gaping hole above? 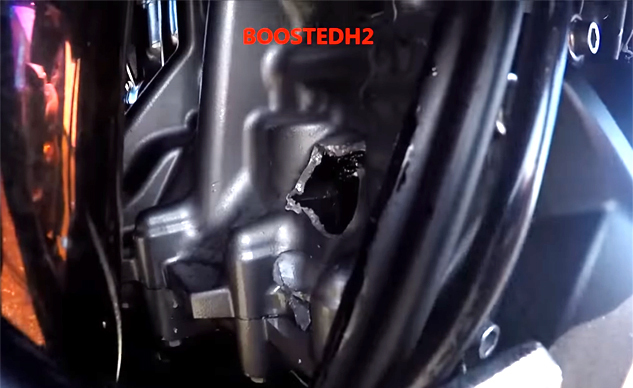 That’s the exit wound from a thrown con-rod after a Kawasaki Ninja H2‘s engine blows on a drag strip. Fortunately, the rider was able to maintain control at such a high speed and coax the H2 to a stop. The speedometer was obscured by sun glare, but the video title indicates the incident happened at 188 mph. An earlier run showed the H2 topping 230 mph, so we know he could have been moving much faster when the engine gave. According to the video description, this unfortunate incident happened during a run at the Loring Mile Harvest drag racing event in Maine. The H2 was heavily modded and had been used in several drag racing runs before it grenaded. Once the initial disappointment passed, the H2 owner seemed more positive than I would have been, as he ends the video with a promise of coming back with a rebuilt motor next year. Get price quotes for Kawasaki from local motorcycle dealers.